The is hands down the best 24" vinyl cutter on the market today! The Graphtec CE-6000 PLUS has 450 gf of downforce pressure for cutting very thin films such as window tint all the way up to the toughest sand-blast mask and reflective materials. It has a max cutting speed of 39 in/sec (in all directions) for quick output of intricate cut jobs. It also includes 3 licenses for Graphtec Pro Studio, a complete design and cutting software solution similar to Illustrator or CorelDRAW—a $2100 value! 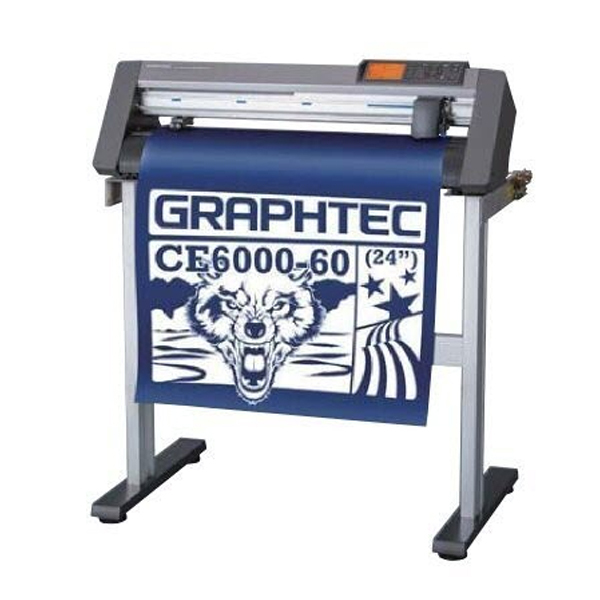 Each CE6000 comes standard with: floor stands (except for the 15" CE-6000-40), Rear media roll rack with new media brake (60" and 120"), Graphtec Studio Software, Cutting Master Plug-In, plus Graphtec's ARMS (Automatic Registration Mark Sensor) system. ARMS is an abbreviation for Advanced Registration Mark Sensing system, which uses sensors to detect registration marks and performs the AXIS ALIGNMENT. It is able to adjust received contour cutting data in the cutting plotter to align with the printed image. It enables to significantly improve productivity in the Print & Cut applications that makes stickers or decals.